Cyclops has never really gotten the respect he deserves from the X-men movies. 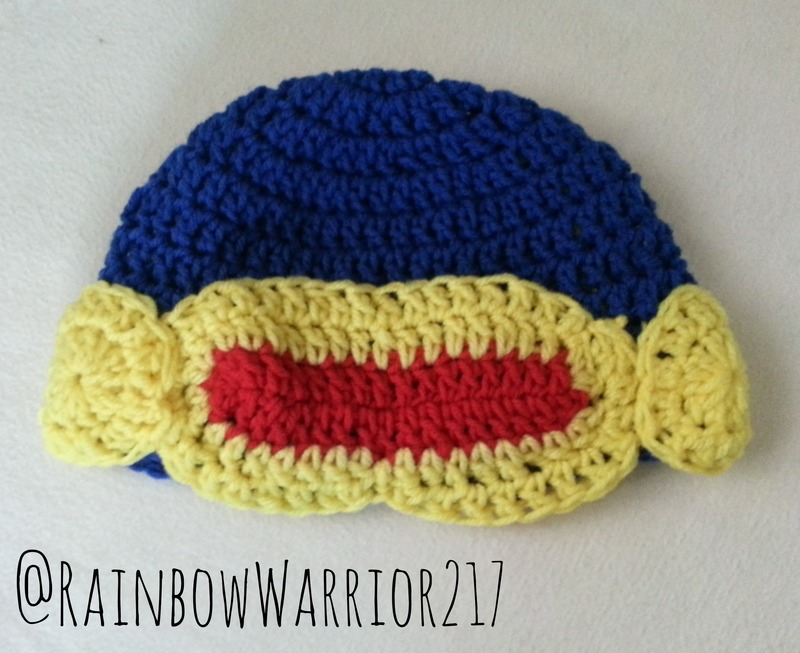 He is one of my favorite characters & I decided to make his helmet in honor of the hero! Round 1: ch 1 & 12 dc in magic ring. sl st to join. Round 12: sc in ea st. sl st to join. Round 1: dc in 3rd ch from hook all the way down, 3 dc in last ch & dc in ea st along opp side of chain. sl st to join. Cut yarn & pull through. Round 2: Attach yellow yarn & ch 1. dc in ea st along the top of your visor, 2 dc in ea st along the sides, when you reach the bottom of your visor continue to dc in ea st until you get to the middle where you will sl st (this is the nose section), continue to dc in ea st all the way around. sl st to join. Round 3: Rep round 2 – dc in ea st around, 2 dc in ea st along the sides, sl st in same place last round, continue to dc around & sl st to join. Cut yarn & pull through. Using yellow yarn, make a magic ring & ch 1. Round 1: 12 dc in ea st, sl st to join. Round 2: *2 dc in first st, 1 dc in next st* sl st to join. Cut a medium length tail & create a second circle the exact same way. Cut a medium-length of yellow yarn OR you can use the tails from your pieces if they are long enough. Thread needle and sew your visor to the bottom of you hat. Weave your yarn through the outside stitches to secure. Sew each circle to the side of the visor. Thread tapestry needle & weave yarn through outside stitches of circle and your beanie. Pattern Notes: You can use any beanie pattern in place of mine to create your desired design & shape. This pattern fits standard adult size. I am really happy with the way this design turned out! I planned to create the visor so that it could flip down on your face – but couldn’t quite work that out. I used the classic Cyclops colors, however, you can of course switch it up!